This is a step by step tutorial explaining the demo slide_and_pinjoint.py included in pymunk. You will find a screenshot of it in the list of examples. It is probably a good idea to have the file near by if I miss something in the tutorial or something is unclear. Pygame is required for this tutorial and some of the included demos, but it is not required to run just pymunk. Pymunk should work just fine with other similar libraries as well, for example you could easily translate this tutorial to use Pyglet instead. Pymunk is built on top of the 2d physics library Chipmunk. Chipmunk itself is written in C meaning Pymunk need to call into the c code. The Cffi library helps with this, however if you are on a platform that I haven’t been able to compile it on you might have to do it yourself. The good news is that it is very easy to do, in fact if you got Pymunk by Pip install its arelady done! A rigid body holds the physical properties of an object. (mass, position, rotation, velocity, etc.) It does not have a shape by itself. If you’ve done physics with particles before, rigid bodies differ mostly in that they are able to rotate. Spaces are the basic simulation unit in Chipmunk. You add bodies, shapes and joints to a space, and then update the space as a whole. The documentation for Chipmunk can be found here: http://chipmunk-physics.net/release/ChipmunkLatest-Docs/ It is for the c-library but is a good complement to the Pymunk documentation as the concepts are the same, just that Pymunk is more pythonic to use. The API documentation for Pymunk can be found here: API Reference. The code will display a blank window, and will run a physics simulation of an empty space. We then create a space and set its gravity to something good. Remember that what is important is what looks good on screen, not what the real world value is. -900 will make a good looking simulation, but feel free to experiment when you have the full code ready. In our game loop we call the step() function on our space. The step function steps the simulation one step forward in time. It is best to keep the step size constant and not adjust it depending on the framerate. The physic simulation will work much better with a constant step size. All bodies must have their moment of inertia set. If our object is a normal ball we can use the predefined function moment_for_circle to calculate it given its mass and radius. However, you could also select a value by experimenting with what looks good for your simulation. After we have the inertia we can create the body of the ball. And in order for it to collide with things, it needs to have one (or many) collision shape(s). Finally we add the body and shape to the space to include it in our simulation. Now that we can create balls we want to display them. Either we can use the built in pymunk_util package do draw the whole space directly, or we can do it manually. The debug drawing functions included with Pymunk are good for putting something together easy and quickly, while a polished game for example most probably will want to make its own drawing code. Most of the examples included with Pymunk uses this way of drawing. With the add_ball function and the debug_draw call and a little code to spawn balls you should see a couple of balls falling. Yay! We create a “static” body. The important step is to never add it to the space like the dynamic ball bodies. Note how static bodies are created by setting the body_type of the body. A line shaped shape is created here. Again, we only add the segments, not the body to the space. In order to get the position with the line rotation we use this calculation. line.a is the first endpoint of the line, line.b the second. At the moment the lines are static, and not rotated so we don’t really have to do this extra calculation, but we will soon make them move and rotate. 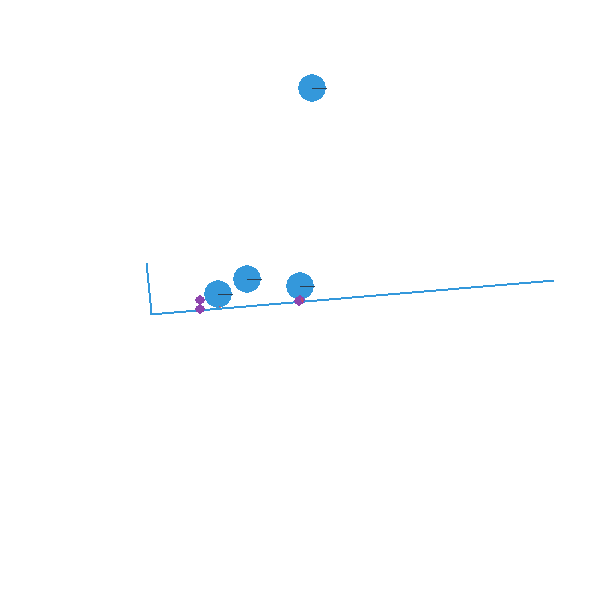 """Small hack to convert pymunk to pygame coordinates"""
With the full code we should something like the below, and now we should see an inverted L shape in the middle will balls spawning and hitting the shape. A static L shape is pretty boring. So lets make it a bit more exciting by adding two joints, one that it can rotate around, and one that prevents it from rotating too much. In this part we only add the rotation joint, and in the next we constrain it. As our static L shape won’t be static anymore we also rename the function to add_L(). This is the rotation center body. Its only purpose is to act as a static point in the joint so the line can rotate around it. As you see we never add any shapes to it. The L shape will now be moving in the world, and therefor it can no longer be a static body. I have precalculated the inertia to 10000. (ok, I just took a number that worked, the important thing is that it looks good on screen!). A pin joint allow two objects to pivot about a single point. In our case one of the objects will be stuck to the world. Create a slide joint. It behaves like pin joints but have a minimum and maximum distance. The two bodies can slide between the min and max, and in our case one of the bodies is static meaning only the body attached with the shapes will move. You might notice that we never delete balls. This will make the simulation require more and more memory and use more and more cpu, and this is of course not what we want. So in the final step we add some code to remove balls from the simulation when they are bellow the screen. Loop the balls and check if the body.position is less than 0. If that is the case, we add it to our list of balls to remove. To remove an object from the space, we need to remove its shape and its body. And then we remove it from our list of balls. And now, done! You should have an inverted L shape in the middle of the screen being filled will balls, tipping over releasing them, tipping back and start over. You can check slide_and_pinjoint.py included in pymunk, but it doesn’t follow this tutorial exactly as I factored out a couple of blocks to functions to make it easier to follow in tutorial form. """Add a ball to the given space at a random position"""
"""Add a inverted L shape with two joints"""